Cheap coolers won’t get you very far in the blistery summer conditions where most of us do a fair bit of our fishing. If you want your frozen baits to stay fresh for days, or need a giant cooler to store your catch, check out the products available from Grizzly Coolers. We first saw the Grizzly line at the recent ICAST sportfishing trade show, and we were super impressed with the quality and workmanship put into these coolers, which are manufactured in the United States. Grizzly coolers feature a double-wall construction process with foam sandwiched in between the hard, molded polyethylene body. The coolers are pretty much indestructible. You definitely don’t have to worry about them being banged up in the cockpit or losing a hinge. The latching system is certified “bear” resistant (hence the name Grizzly) and there’s a thick rubber gasket on the lid of the cooler to insure a tight fit to keep ice as long as possible. The big drain has a wide channel to help get out any water and debris in the cooler. The oversized opening makes it easier for any fish gurry to escape through the drain without getting clogged up. 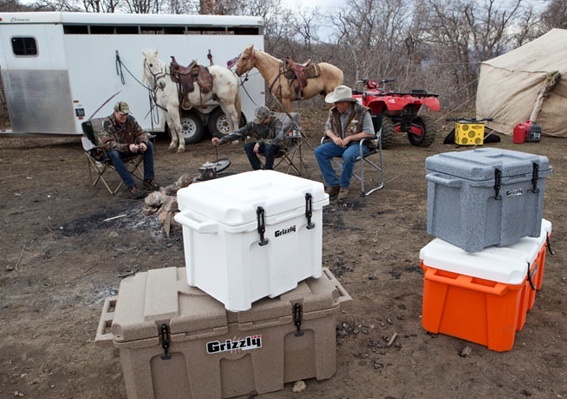 Grizzly makes coolers in a wide range of colors for just about every occasion, but they specialize in making tough coolers for hunting and fishing. The company offers three marine coolers — the massive 400, which is said to hold up to three quartered elk! This giant cooler can carry 350 pounds of fish, or 500 cans of beer. The 150 is more manageable but still offers a ton of cold storage for up to 122 pounds of fish. The 60 holds 48 pounds of game meat, and can keep 78 beers nice and cold. The coolers start at $330 and come with a lifetime warranty. If you end up buying a new cooler every season, you might want to step up to the plate and invest in a tough, built-to-last cooler such as the Grizzly. For more information visit www.grizzlycoolers.com.